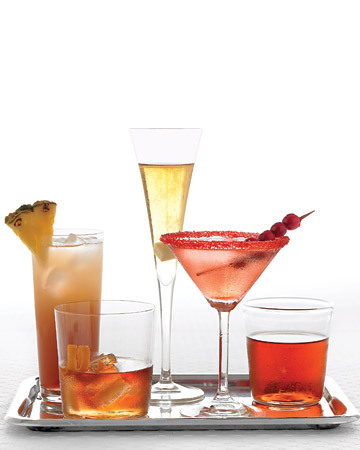 Knowledge of a good selection of classic cocktails is essential and here are some of the favorites. Combine equal parts Guinness and champagne. Mix 1 part vodka with 2 parts tomato juice. Stir in a dash of Worcestershire sauce, a few drops of Tabasco and a squeeze of lemon. If you would like more spice add a tsp of horseradish. Shake together 1 part brandy, 1 part creme de cacao and 1 part heavy cream. Serve dusted with freshly grated nutmeg. Serve 1 part freshly squeezed orange juice topped up with 1 part champagne. Shake 1 tbs lime juice with 3 tbs white rum and 1 tsp sugar on crushed ice. Pour into a sugar-frosted glass. Add fruit, such as banana or strawberry. Shake 2 parts gin with 1 part dry white vermouth along with ice in a shaker. Pour into a glass and add a stuffed green olive or pickled baby onion. Place some ice in a tall glass and add 2 parts vodka and 6 parts orange juice. Then float 1 part Galliano on the surface. Mix equal parts of vodka, gin, light rum. and tequila with lemon. Sweeten with a little sugar syrup and top with cola. Serve on ice. Mix 1 part each of dry and sweet vermouth with 4 parts of rye whiskey. Shake 1 part Curacao, 4 parts tequila and 1 part lime juice. Serve in a salt rimmed glass. Shake 3 parts white rum with 4 parts pineapple juice and 2 parts of coconut cream long with 2 tbs grenadine and 1 tbs sugar syrup. serve decorated with pineapple and maraschino cherry. Stir 2 parts whiskey with 1 part Drambuie and serve on ice. Mix 1 part tequila with 2 parts orange juice. Add 1 tsp of grenadine and serve over ice. Shake 1 part whiskey with the juice of 1/2 lemon and 1 tsp sugar with crushed ice. Pour into a cocktail glass.